Thanksgiving at Nuremberg « Hercules and the umpire. Some of us, perhaps most of us, have much to give thanks for this November 27, 2014. It is very much worth remembering as we enjoy our good fortune that nearly 70 years ago Justice Robert Jackson celebrated Thanksgiving in an unusual manner while in the midst of the Nazi war crimes trials. Indeed, I assert that Jackson’s Thanksgiving in 1945 ranks second only to that first one celebrated by the Pilgrims. It commemorated and gave thanks for the triumph of law over the greatest evil that civilization has ever known. With deep appreciation and great thanks to John Q. Barrett, Professor of Law, St. John’s University, and Elizabeth S. Lenna, Fellow, Robert H. Jackson Center, I invite you to read next about Justice Jackson’s Thanksgiving all those many years ago. 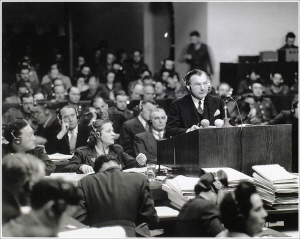 In the autumn of 1945, Thursday, November 22, marked the first day of trial evidence at Nuremberg. In that city, located in the United States military occupation sector of the defeated, surrendered former Germany, the international trial of accused Nazi war criminals had commenced two days earlier in Courtroom 600 in the Palace of Justice. On November 20, the trial opened with Allied prosecutors reading the indictment against twenty-two individual defendants and six defendant Nazi organizations. Prosecutors from the U.S., the United Kingdom, the Soviet Union and the French Republic took turns reading the lengthy document to the International Military Tribunal and the 20 of 22 individual defendants who were present in court. The process was serious and, as it filled the full day, soporific—reporters and spectators who had obtained courtroom tickets with difficulty began to leave early. On the next morning, Wednesday, November 21, each defendant stood in turn and entered a plea of not guilty. The president of the Tribunal then called on Justice Robert H. Jackson, the United States Chief of Counsel, to deliver his opening statement. When trial commenced the next morning, Thursday, November 22, the IMT first ruled on pending defense motions. Defendant Julius Streicher was, the Tribunal announced, sane and fit to appear to present a defense. Defendant Martin Bormann would be tried in absentia pursuant to the London Charter of August 8, 1945. The Tribunal then called on the United States to begin presenting evidence on Count One, which charged defendants with engaging in a common plan and conspiracy to wage aggressive war. Jackson’s Executive Trial Counsel, Colonel Robert G. Storey, explained that most of the evidence to come would be German documents captured by the U.S. and British armies. Associate Trial Counsel Ralph G. Albrecht then explained the Nazi Party and government structures and offered organizational charts as evidence. Major Frank B. Wallis, Assistant Trial Counsel, then began to offer evidence on the Nazi rise to power in Germany and pre-1939 planning for aggressive war. Those trial proceedings did not conclude the courtroom activity in Nuremberg on Thursday, November 22, 1945. In the United States, it was Thanksgiving Day. In Nuremberg, the Allies had not taken the day off to observe the American holiday. But they did, in that first November of peace following years of world war, gave thanks together and quite solemnly. At Justice Jackson’s invitation, hundreds of military and civilian Allied personnel gathered in Courtroom 600 at 5:15 p.m.
Jackson spoke briefly, explaining the American history and tradition of Thanksgiving to his British, Russian and French colleagues. Jackson then called on a member of his staff, Captain Edmund A. Walsh (U.S. Army). In civilian life, he was Father Walsh, a Jesuit priest, the vice president of Georgetown University, the rector of its School of Foreign Service, and long a Jackson friend. For all present, Father Walsh offered an opening prayer. Lieutenant Commander Harold Leventhal (U.S. Coast Guard Reserve), a prosecutor on Jackson’s U.S. staff (and twenty years later a Judge of the U.S. Court of Appeals for the D.C. Circuit), then read from the Psalms. Throughout this service, most of those present, including the senior Soviet prosecutors and the not-particularly-religious Justice Jackson, folded their hands and bowed their heads. [O]n every Thanksgiving, I wish for all of us—religious and not, American and not—that Nuremberg spirit of gratitude, peace, human alliance and the pursuit of justice. And thank you for your interest and friendship. And, for you, more days. As for the War Crimes Trials, wish I knew more about Nuremberg and the ones in Japan, which I have always thought less than fair. Just for yuks, did the defense have any discovery or time to examine it? Was there a defense? On the Net, I took a quick look regarding your questions regarding discovery and time to prepare. I could not find anything definitive and most of what I found that looked promising was behind the Hein pay wall. Sorry. If I get a chance during the next few days, I will run a Westlaw search in the law review database. If I find something, I will report back. They were a little light on due process. [A]s the months passed [the defendants] became flattered by the fairness (at least, fairishness) of the procedures and rose to the bait of making their excuses for posterity. So they played the justice game — none more effectively than Goering himself. His defence (that the resurgence of Germany after the failures of both democracy and communism was only achievable by total support of Nazi ideology) drove Jackson, his American cross-examiner, into a petulant rage. At this level, Goering was able to rebut the absurd conspiracy charge, which sought to try Germany alone for its pre-war political manoeuverings. To his French accuser, who unemotionally put the case for his involvement in crimes against humanity, he had no answer. Geoffrey Robertson, QC, Crimes Against Humanity at 216. It seems that the only practical rule in war is that there are no rules. But for the commission of crimes against humanity, there is and can be no defense. Judge Wallach reminds us that we made waterboarding a war crime. But when our people do it, it suddenly isn’t? And we made “aggressive war” a war crime (throughout our history, it was standard operating procedure), except when we invade a sovereign country on the flimsiest of pretenses. Medical experiments on human beings without their consent also became a war crime in the Doctors’ Trials, except when we do it to our own soldiers (United States v. Stanley, 483 U.S. 669 (1987)). I fear that we haven’t learned enough from Nuremberg. Professor Barrett outdoes himself with each new e-mail about Mr. Justice Robert Jackson. The Justice’s words at Nuremberg ring down through the ages such that all of us who are part of this great profession are challenged anew to do justice to the very best of our abilities. For a highly critical look at the Nuremberg trials from a contemporary author, I’d recommended reading ‘Advance to Barbarism’ by F.J.P. Veale. The video excerpts provided in the youtube link above point to some of his criticisms of the trials. For instance, the defendants appear in civilian clothing as the Allies ‘demobilized’ them at the end of the war, stripping them of most of the commonly recognized protections as Prisoners of War. In the Pacific trials, the trial of General Tomoyuki Yamashita was pursued to the U.S. Supreme court, where it was argued on January 7th and 8th 1946 and decided February 4th, 1946. Sorry, I’m not a lawyer I don’t know how to provide you a better citation. I also find this documentary about Justice Radhabinod Pal, one of the dissenting judges in the Pacific War crimes trials fascinating. Thank you Neil. The clip was fascinating. I add only one caution, and not directed at your comment, but more generally directed. There are still individuals and organizations devoted to publishing and promoting books and essays that deny established facts concerning the Nazi genocide of Jews. See for example the Institute for Historical Review. We should all be cautious about relying upon such sources. The one thing you learn when studying history is that it is never pretty. That we got to the right answer in Nuremberg (that there is now a “law of war”) cannot reasonably be disputed, but how we got there left a lot to be desired. Imagine a judge, insisting on due process! Objecting to enforcement of ex post facto laws! I’m shocked, I say! Shocked!!! It is as if the Judge read Section 9 of Article I of our Constitution, and took it seriously. And his learned colleagues (including Justice Jackson) actively conspired to keep this fatal procedural flaw from public view. In Offutt v. U.S., Justice Frankfurter counseled that “justice must satisfy the appearance of justice.” By this standard, to call the Tribunals a “triumph of the rule of law” is to defile the term, as it was nothing of the sort. Whereas a compelling argument could and ought to be made for crimes against humanity violating jus cogens law, sovereign nations had been invading their neighbors for fun and profit for millenia. As Pal correctly observed, virtually all of Western colonialism would qualify as a war crime under the Charter, the Australian genocide against the Tasmanian aborigine was legally indistinguishable from the Holocaust, and the dropping of the A-bomb was a per se crime against humanity. Somehow, there is a certain karmic justice in the fact that that kangaroo court was presided over by an Australian. Judge Pal deserves our high praise for displaying an uncommon commitment to justice. Thank you for that, Neil. A brilliant documentary. Well worth any spare time you might have. had been some trials after WW I, but the major offenses were new. Yamashita’s case from the Pacific involved a new doctrine of command responsibility applied to a general who was not in Manila and troops not under his command. On Pacific Trials there is a fairly recent book Yamashita’s Ghost by Allan A Ryan published by U of Kan press’ It came out in paper last month, one of a number of studies on war crimes and other aspects of law of war from that source. Ryan is a former DOJ lawyer both in SG’s office and special projects which deals with Nazis among us. The Allies invented new war crimes after the fact, charged Axis leaders with them, and denied them their most effective defense. This was a triumph of the rule of law?